I finished warping, tied on, and started weaving.Â Then I noticed that the warps weren’t lined up properly (the first section was white, so it wasn’t obvious initially).Â I sighed, cut off the five inches I’d woven, advanced the bouts so they did line up, and then re-tied on.Â (This was more laborious than you’d think since the warp was in three layers).Â I wove another three inches, and realized that this threading won’t do.Â I had interspersed the bouts in wide stripes, hoping to make the stripes somewhat visible – this turned out to be a stupid thing to do because now the stripes dominate, giving a very rigid look.Â Which I should have known, and would have known if I’d simulated it in Photoshop first.Â *sigh*Â C’est la vie, I guess. 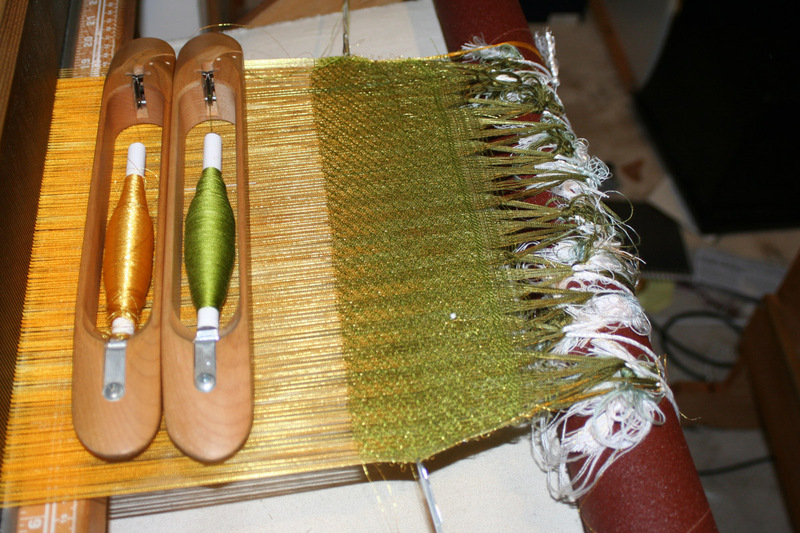 painted warp, showing the striping. The colors are beautiful, and the striping is too, just not the effect I want! Interestingly, the fabric looks quite different from the side and from the front – it has a beautiful iridescence to it, and a lovely glitter from the gold.Â All of which makes it that much more difficult to cut off and rethread the damn thing.Â Due to the way I’ve set up the warps, I think I will have to intersperse the warps in groups of four – will have to think that through – that would make each warp stripe 1/10″ wide.Â But if I can intersperse them every other thread, so much the better! 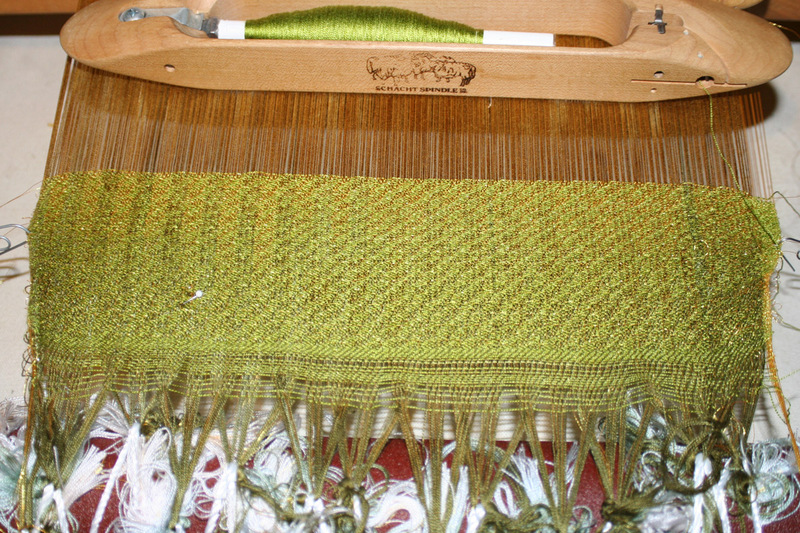 Fortunately it should be possible to recreate the cross and separate out the three layers of warp again.Â It will be a bit tricky, but feasible.Â However, I am NOT looking forward to re-re-rethreading the warp.Â I enjoy the warping process, but this is a little much!Â I want to get to weaving. I have considered whether weaving off this 48″ panel would produce useful results – that would let me get some weaving done before having to rethread – but have reluctantly concluded that it will not.Â The vertical stripes kill the feeling of organic movement – the only question this sample would answer would be “Will the cloth be strong enough?” That is, admittedly, my primary question, but I want to be able to answer other design questions as well.Â So, tempting as it is to continue on, there is really nothing for it but to cut off and re-thread.